When it comes to the market's February freakout, when the Feb 5 volatility explosion resulted in a brief correction for the S&P, we now know that it could not have come at a better time (or faster) for US banks - not only the money centers, but pure-play trading desks like Goldman benefited from a substantial burst in equity-trading revenue. As Goldman explained this morning, this was due to "higher results in both derivatives and cash products" as well as higher "commissions and fees reflecting higher market volumes, and net revenues in securities services were higher, reflecting higher average customer balances." In short, the sellside - which mostly made its money on commissions and a surge in volume instead of directional trades - loved the February volocaust. Not so much the buyside, however, which was whipsawed in either direction and slammed by the abrupt end in momentum. 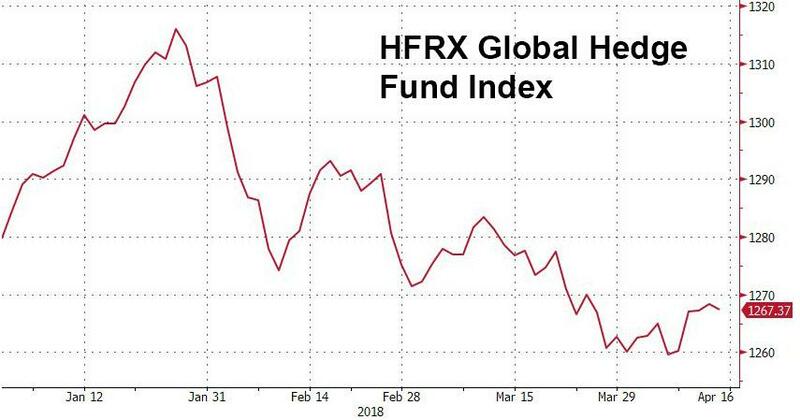 For a quick confirmation of the pain in hedge fund desks this year, look no further than the HFRX global hedge fund index according to which the average hedge fund is still down for the year. So why did the buyside hurt so much? For the answer, we refer readers to an overnight report from Goldman's new derivatives strategist Rocky Fishman (whose year-end bonus prospects now look much better), who points out that while implied vol, i.e., VIX, briefly went bananas, it was the surge in realized vol that was the real shock, at least when it comes to P&Ls. According to Fishman, while Q1 realized volatility was not extreme in absolute terms, it was a sharp reversal from 2017 that stood out. 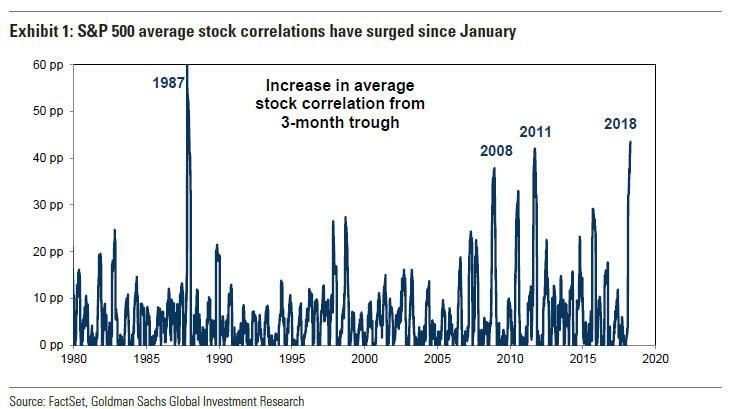 In fact, according to Goldman's calculations the magnitude of the surge in realized vol from Q4 2017 to Q1 2018 - which rose 3.5 times - has been observed just twice in history: "only in the Cuban Missile Crisis and the 1987 crash had quarter-over-quarter SPX realized vol tripled over the past 70 years." 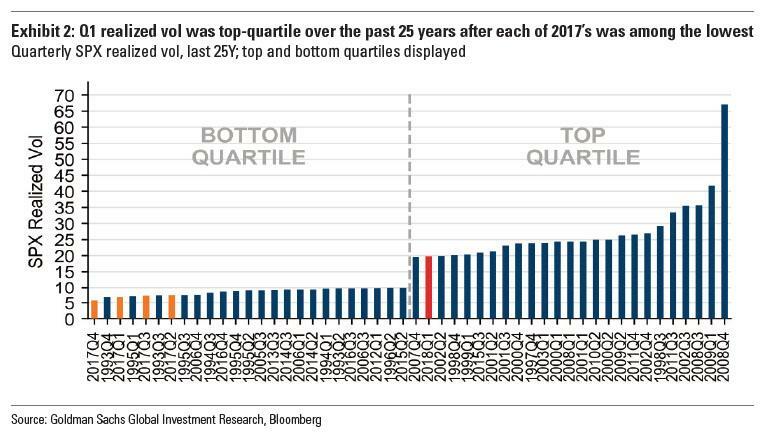 As Fishman further shows in the chart below, Q1 SPX realized volatility was top-quartile compared with the past 25 years, a sharp contrast to each quarter of 2017 being among the several least volatile quarters of the same period. 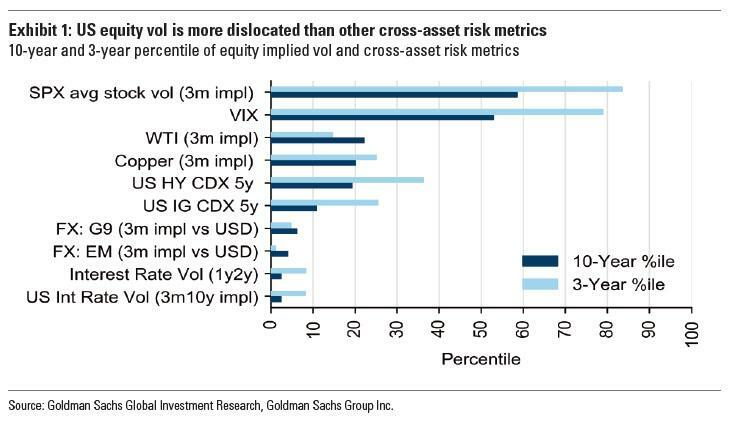 ... namely that abnormally - and persistently - high volatility remains largely a stock market feature, with few if any other asset classes suffering the same vol. EFA ETF implied volatility has an unusually large discount to the SPX’s. The EFA’s realized vol has been several points below SPX realized vol, and correspondingly the VXEFA index of EFA implied volatility is five points below the VIX, leaving EFA hedges at an unusually large discount to SPX hedges. Low EFA vol has been driven primarily by low realized vol across its European country sub-indices; USD-based Eurozone, UK, and Switzerland ETFs have each had around 5 points lower realized vol than the SPX over the last two months even though each typically is more volatile than the SPX. VSTOXX futures are below VIX futures across tenors. The discount of short-dated VSTOXX futures to VIX futures is not surprising given its strong connection to the now-negative realized EuroStoxx 50 vs SPX volatility spread. 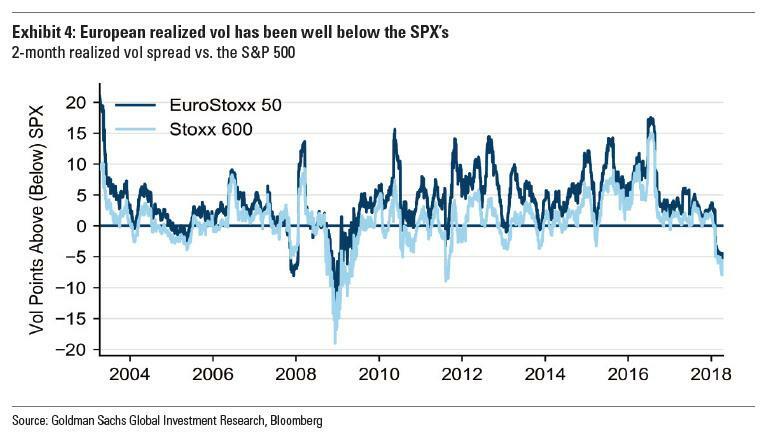 EuroStoxx 50 realized volatility has been materially below the SPX’s for the first time since the financial crisis. The more-diversified Stoxx 600 (SXXP Index) which more often has lower volatility than the SPX has had around the same volatility as the SPX over the long run, but currently has had around 6 points lower volatility than the SPX over the two months ending 13-Apr. We do not see important factors driving the SPX to stay more volatile than other regions on a sustained basis. Economic conditions and other indicators of equity vol levels would be consistent with lower US equity vol; however, we are monitoring economic data for turning points toward worsening growth. SPX calls are still rich. 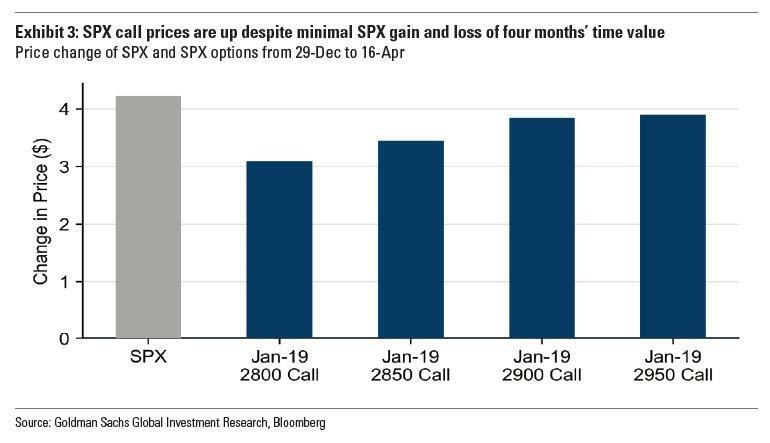 Several January-expiration S&P 500 call prices remain as high as they were when the SPX spot was at approximately its current level months ago, in effect letting vega gains offset four months of time decay. For investors that want to express the view that upside beyond January’s high may be limited, one can sell SPX calls vs existing long equity positions. The options sold would generate premium that can be used as income or to purchase protection. In other words, those who think the market won't rise much higher should sell S&P calls. Thanks Goldman.